Skepticamp is the brainchild of Reed Esau. It’s an informal meeting, or anti-meeting, where anyone can speak on just about any subject. Many local Skeptics in the Pub and other skeptic groups are discovering the joy that is Skepticamp. 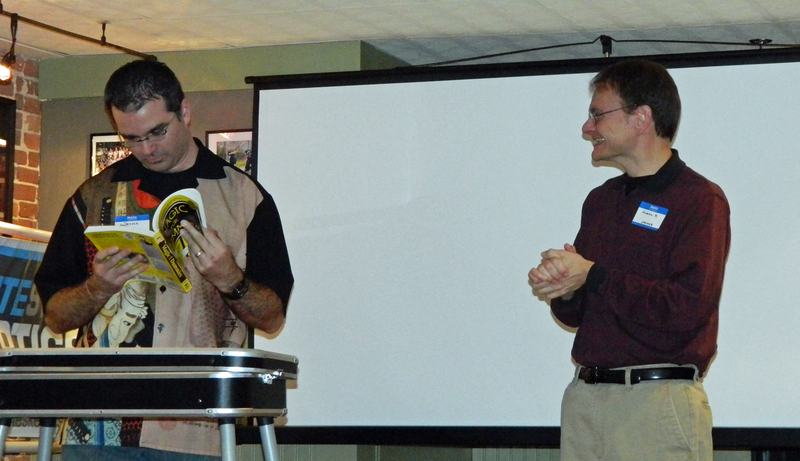 The Granite State Skeptics had their second Skepticamp in Concord NH on October 27th. I particularly enjoy the venue, the Barley House restaurant, as we are given a lovely basement that has comfortable sofas and armchairs. If you are going to be sitting from 11-4, you want comfortable seating. Just one of the highlights…. We also have lunch. Everyone places their orders before the first break, and not long after we are all served while sitting and listening to speakers. We don’t do a lunch break, just a few shorter 10 minute breaks. The Barley House wait staff is very quiet and also good at figuring out who gets what bill. We pay up during another break, and beer and drinks are available from a bar all through the camp. It makes for a very comfortable and relaxed audience. The best part about Skepticamp is being surprised by the speakers. Who knew that Larry had seen a UFO when he was an Air Force pilot? Who knew Andrew hold solved a UFO mystery just by checking Google? One scientist spoke not of science, but of her experience running a book club. Dezrah dazzled us with magic, but also spoke of how magic taught him we can all be fooled. I even got called in at the last minute with a cancellation to help Travis Roy talk about the Hill archives at UNH. Hill expert Travis Roy learned something new, when I told everyone the Hills were not the first reported alien abduction experience. Those honors go to Antonio Boas, who had a far more interesting night than the Hills. Let’s just say when I do my blog post on Antonio Boas, it won’t be G rated. 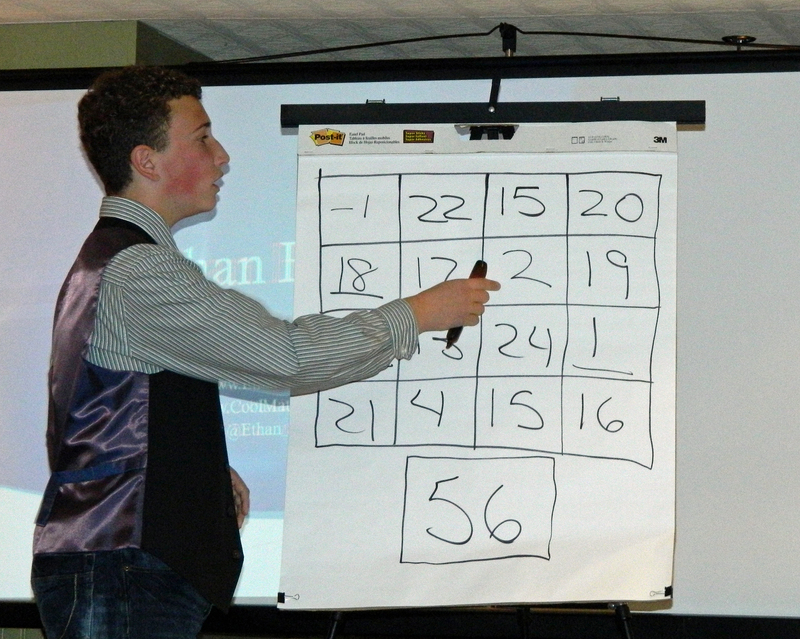 Ben Pratt entertains during a break. I really enjoy hearing what your “average” skeptic is passionate about ,or has to knowledge of, during Skepticmap. The A list speakers are wonderful, but the rest of us also have a lot to share. Dale Roy, co founder of Granite State Skeptics, did a wonderful job getting the non-speakers to speak, arranging a venue that was comfortable, and borrowing the worlds biggest screen for power point presentations. Hey, she and Travis made it work. I already look forward to next year, and have secured promises from Andrew and Larry to write for this blog about their UFO presentations. Skepticamp is all about learning how truly interesting all skeptics are. Just give skeptics a chance to speak. The average skeptic is doing some terrific work living a life of critical thinking, and it’s important to share that. Plus it’s hilarious when a seasoned top secret cleared Air Force pilot tells you how he saw a UFO, and yes, it did turn out to be Venus. Hearing his experience ,while drinking a beer and sitting in a comfy chair, makes for a very memorable Skepticamp. « Sermons for the non religious, or my so called skeptic speaking career. Ha. When I drove through Concord before I came to Evelyn’s wedding, that’s the place I stopped to eat! But I sat on patio outside, never saw the basement.